The graph above represents the number of peer-reviewed publications as referenced by PubMed (through 2014). PubMed is a division of the US National Library of Medicine and the National Institute of Health. The graph above represents the number of grants awarded by the NIH through 2014 based on the RePORTER database. RePORTER indexes data and analyses of NIH research activities. If there is a topic of interest, a specific contemplative scientist, or concept, type it in the search area on the home page of Contemplative Mind in Life [Link] and I am likely to have some information herein. If not, feel free to post a comment, and I’ll be happy to find out more detail or address it personally. Hello, My name is Lee Yule, iam studying Psychology at Birkbeck University London. I am currently researching for my final year project and am interested in the effects of mediatation on attention, in particular deautomization of attentional responses. I am looking for a psychological test other than a stroop test that measures habitual responses. Any advice on research in this area or a possible test would be great. I would like to bring your attention to the Solloway Mindfulness Survey at http://www.devtestservice.org The SMS is offered free to teachers and their students. Teachers can download their students’ SMS measures in order to monitor growth in mindfulness. The SMS also has a journaling function so that students can reflect on their mindfulness experiences and get feedback from their teachers. The journal data can also be downloaded by the teachers. Students have access to their individual measures and their journal dialogues with their teachers. The SMS has been rigorously tested with a statistical reliability of .94. The SMS pages provide peer-reviewed articles describing the development of the SMS. SMS items are based on the journal entries of mindfulness students who commented on their (1) ability to experience a state of intentional attention—paying attention on purpose, with curiosity, kindness, openness, and a non-judgmental attitude, and (2) associated experiences, such as new insights, new connections and changes in their experience of time. The SMS measures the effects of intentional attention: (1) the experience of intentional attention itself, and (2) the results of intentional attention. Because the statistical reliability of the SMS is high (.94 or higher), it can be used to monitor the progress of individual students as well as groups. Narrative descriptions of mindfulness practice accompany SMS measures. The narrative for each measure has three parts: Description of mindfulness practice at that level, a representative journal entry of a student at that level, and suggestions for the stage in Alan B. Wallace’s book, The Attention Revolution: Unlocking the Power of the Focused Mind, a person at that measure most likely would benefit in order to continue growing in mindfulness practice. You can see these narrative descriptions at the bottom of the “Teacher Information” page (http://www.devtestservice.org/mindfulness/m-teacherinfo.php). All SMS resources are offered free for mindfulness teachers and students. Researchers may use the SMS and journal functions with data download access for a nominal fee. Nice post. I study one thing more difficult on totally different blogs everyday. It would at all times be stimulating to read content material from other writers and observe a bit of one thing from their store. I’d desire to make use of some with the content material on my weblog whether or not you don’t mind. Natually I’ll give you a link on your net blog. Thanks for sharing. This is a really beneficial study for me, Must admit that you are amid the very most excellent bloggers I ever saw.Thanks for posting this informative article. As per your instructions, I typed “Transcendental Meditation” into your search engine, which returned nada. I realize your focus is mindfulness, but have you ever considered that the findings you report (e.g. https://contemplativemind.files.wordpress.com/2014/10/meditation_brain.jpg) may not be correct in the context of a “practice” (for lack of a better word) that is based on taking advantage of the propensity of the mind to wander? For the 8 TM studies conducted and analyzed, the largest clusters were found in premotor and supplementary motor regions as well as dorsal striatal regions – findings that have been similarly found in focused attention and open monitoring sytles of practice. There are some unique components as well. Check out the review. Comment from discussion DMNDAN’s comment from discussion "Is brain training useful for the mind? 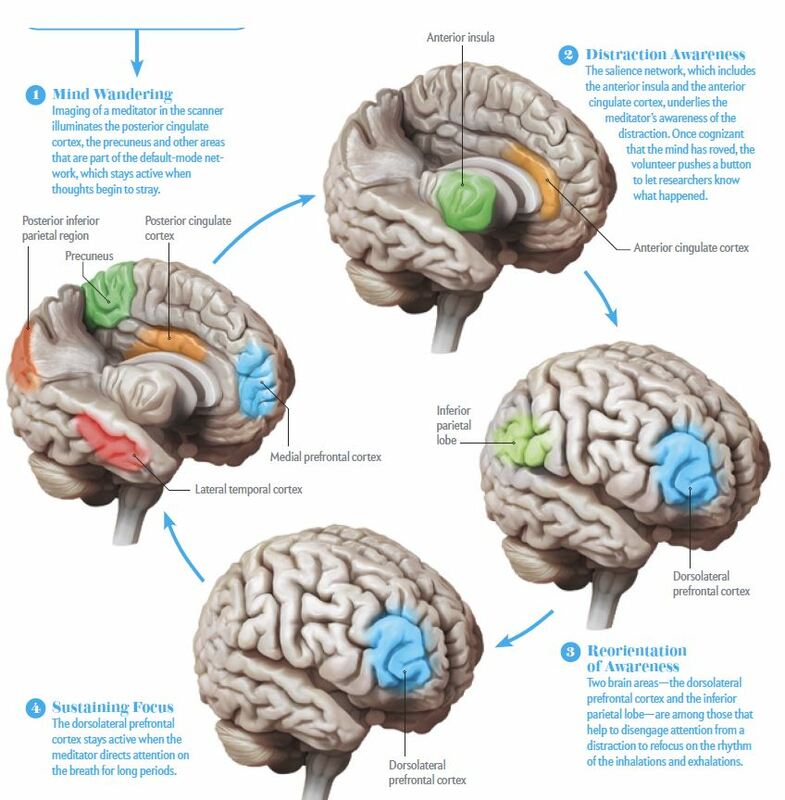 (A neuroscience perspective)". There is, as far as I know, only one fMRI study published on TM, and it had nothing to do with what you mention. TM is unique not because of how it is “described,” but because of how it is taught. Anyone can say “think a mantra, but don’t try,” but that merely leads to confusion for the vast majority of people. The tradition TM comes from asserts that only an enlightened teacher has the intuition necessary to impart the intuitive, mind-wandering practice we call TM (https://www.youtube.com/watch?v=cjem4YfJGQI) but Maharishi Mahesh YOgi set out to prove that tradition wrong by devising a teaching play — where the TM teacher learns to use the same words, hand-gestures, body language and tone-of-voice that Maharishi used to teach meditation — and rehearses that play for 5 months, in residence, before being certified as a TM teacher. The result is entirely different in physical effect than “mantra meditation” or other “focused attention” practices. This is thought to be due to the activity of the thalamus reducing to the point that is no longer either processing external sensory data NOR accepting processed data from the feedback thalamocortical feedback loop mechanism. This last is a major issue: most meditation researchers outside the TM community accept the Buddhist division of meditaiton practices. This is ironic as TM comes from the advaita vedanta tradition which sprang up during the debates between the Founder, Adi Shankara, and the major Buddhists scholars of his day, which resulted in buddhism being driven out of India (according to modern Hindu teachings). Thanks Saiijanai. Your perspective is much appreciated. I look forward to reading up on the links you provided. I presume it is extremely imperative advice I think. Not to mention i’m satisfied learning all your information. Nevertheless should certainly memor concerning only a few broad important things, The web site style and design is best, the article content is admittedly fantastic.